Heaney offered his reader a clue as to how to ‘enter’ the ‘Squarings’ poems: You could think of every poem ( ) as the peg at the end of a tent-rope reaching up into the airy structure, but still with purchase on something earth­ier and more obscure (DOD 320). Heaney offers a master-class in describing, in the closest detail imaginable, what it takes to be a successful marble-shooter. Viewed through the lens of time a first order experience takes on new significance. Heaney runs through the infinite modulations of a childhood game played in the road outside Mossbawn farm, weighing up (squarings) everything that precedes his marble-shoot within the unwritten code of rules (allowed): the lining up stage (anglings, aimings); the mock attempts (feints); the eyes narrowed in concentration (squints); the crouching body (Hunkerings); the warmed up muscles (tensings); the variable grip (pressures of the thumb); the practice actions (test-outs); the attempts abandoned in mid-action (pull-backs); the re-startings from scratch (re-envisagings). 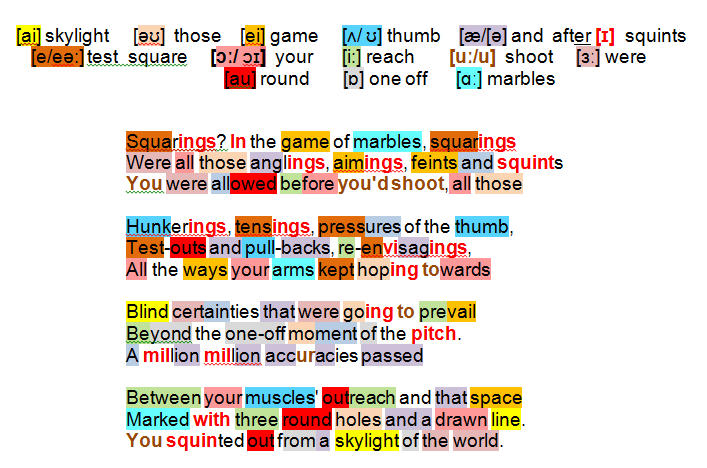 The participle-nouns are plural – this exercise was repeated whenever Heaney took a shot. As one, body and mind were optimistic (your arms kept hoping), closed to the possibility of shooting badly (Blind certainties that were going to prevail) until the launch announced otherwise (Beyond the one-off moment of the pitch). The marble’s trajectory is subject to a million million accuracies between the arm’s follow-through (your muscles’ outreach and landing-site , a space like the Squarings poems themselves, with a geometric design (three round holes and a drawn line), a stylized hieroglyph that opened a porthole of perception to what lay beyond the instant: You squinted out from a skylight of the world. The boy setting up to achieve the perfect shoot will, of course, grow into the poet drafting and redrafting to come up with the perfect poem.